The Sikh Network in conjunction with Guru Nanak Gurdwara Smethwick, and many talented artists and poets, will be presenting an exhibition of Arts at the Guru Nanak Gurdwara in Smethwick, Birmingham. Bapu Surat Singh Khalsa, an 83 year old grandfather, left the comforts and luxuries of his life in the USA, to free Sikh political prisoners in India who have served their sentences but still imprisoned. 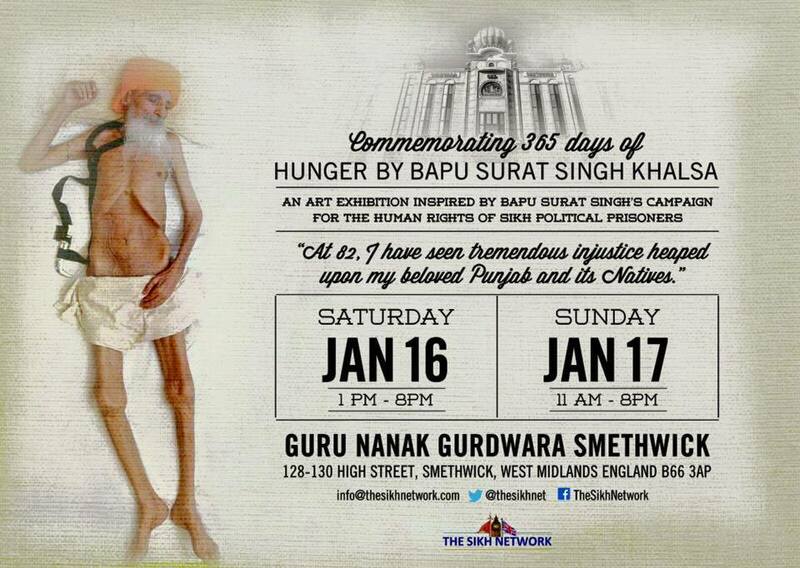 We have witnessed the release of 2 prisoners, thanks to Bapu Surat Singh’s campaign.To mark these testing 365 days, an art exhibition inspired by Bapu Surat Singh’s campaign to free political prisoners will be held at Guru Nanak Gurdwara Smethwick on 16/17th January. Please all attend to show your continued support for Bapu Surat Singh & for the talented artists who have expressed their support in such a beautiful and heartfelt way!